Eurodollar continues moving upwards; stop on my buy order is already in the black. Most likely, market will reach new maximum during Thursday. Target for bulls is several fibo-levels in upper area, near level of 1.3850. 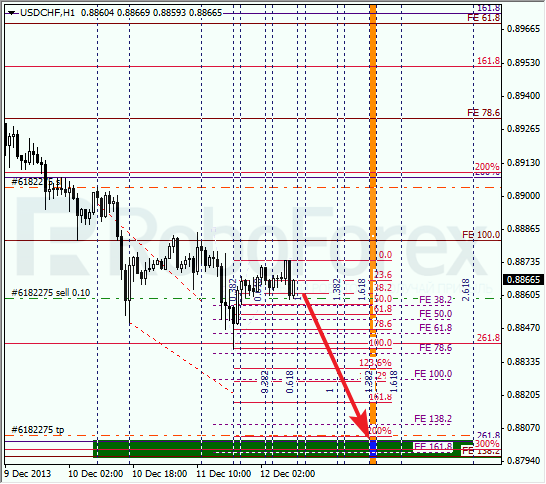 At H1 chart, price is being corrected. In the nearest future, pair may enter temporary fibo-zone and reach predicted target levels. If later price rebounds from them, pair may start new correction. Franc also may yet move downwards for a while. During local correction, I opened short-term sell order. In the future, price is expected to continue falling down towards lower fibo-levels at 0.8800. 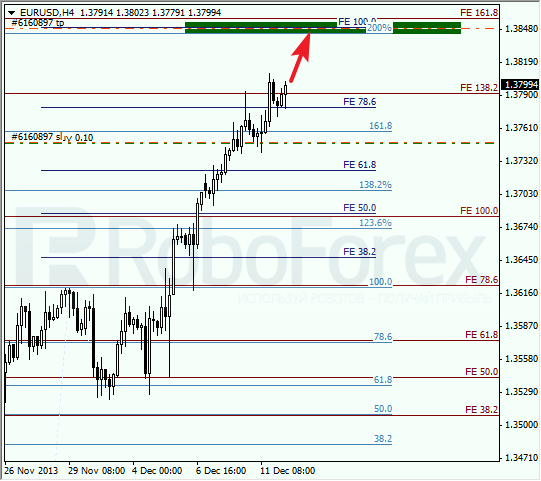 At H1 chart, we can see one more fibo-level, 161.8%, inside target area. According to analysis of temporary fibo-zones, lower levels may be reached during the day. I’ll move stop into the black right after pair starts moving downwards.